Over the Fourth of July, they ride into Hailey with their characteristic style, bright smiles, riding savvy, willingness to work and showmanship. They are the contestants of the 2014 Miss Days of the Old West contest sponsored by the Sawtooth Rangers Riding Club. And the rodeo wouldn’t be the same without them, just like an ample amount of patriotic flag waving is a major part of America’s holiday. Eight girls and young women are showing their skills at Hailey Rodeo Park this week where the 67th annual Days of the Old West rodeo will be entertaining thousands of spectators for three performances. Joining this year’s queen contest are these numbers, featuring competitive contests in each category: Two for Senior Queen, two for Teen Queen, two for Junior Queen and two for PeeWee Queen. The eager contestants and their horses are accompanied by the reigning royalty from last July. All are here brightening the star-spangled stage until the Independence Day holiday has run its patriotic course. Contest organizer Michelle Bobbitt of the Sawtooth Rangers has an able crew helping out including those making the final decisions. This year’s judges are Harold Boggs of Hazelton, Vicki Baxter of Hansen and Jessica Lancaster of Jerome. The contestants will wear prairie skirts or Western dress, with their hats, boots and belts. They will answer impromptu questions and will be interviewed individually in the personality area. Freestyle horsemanship, a non-mandatory yet important part of the Miss Days contest, will be performed as pre-rodeo entertainment at 6:30 p.m. today, Wednesday prior to “Family Night,” which is the first of three Hailey rodeo shows starting at 7:30 p.m. The PeeWee and Junior Queen contestants will do their freestyle patterns tonight, with the other contestants doing their thing Thursday. Once the rodeo gets underway, the royalty will help with the cattle in the arena. They will be required to pack flags on their horses. Great ambassadors of the sport, they will gladly mingle with the public and will sign autographs that will put smiles on the faces of the kids. · Thursday, July 3: Horsemanship competition at 10 a.m. at Hailey Rodeo Park. The Senior Queen and Teen Queen contestants will perform their freestyle horsemanship patterns at 6:30 p.m. before the rodeo. The Intermountain Professional Rodeo Association (ImPRA) and Idaho Cowboys Association rodeo starts at 7:30 p.m. For each rodeo, contestants will wear show apparel, pack flags and meet spectators. · Friday, July 4: The royalty candidates will also wear their show apparel for the Mile Long Parade starting at 12 noon along Hailey’s Main Street. They will have their coronation at 6:30 p.m. as part of the pre-rodeo entertainment. The Grand Entry and playing of the national anthem on the country’s birthday will be a proud time for all. You’ll certainly get a lump in your throat and stand a little taller when the flag circles the arena, in silence. Mickenlie was the Teen Queen at Hailey’s rodeo in 2012. Last year in Hailey, Mickenlie earned the high-point royalty saddle and matching headstall from the Sawtooth Rangers and Shoe & Tack Shop. She swept the special categories, winning Poise and Personality, Photogenics, Speech and Horsemanship in the Senior Queen contest. “It has been an exciting journey representing Hailey’s Days of the Old West Rodeo,” Baxter said. · Zoie Pierce, 15, is a daughter of Jim and Karen Pierce of Jerome. Like Mickenlie Baxter, Zoie swept the Teen Queen special categories last July—Poise and Personality, Photogenics, Speech and Horsemanship. Winning Teen Queen in Hailey gave Zoie the opportunity to compete for IMPRA Teen Queen last September in Hailey, and she won that title as well. She represented Hailey and IMPRA at the Gooding and Jerome rodeos, and at the IMPRA awards banquet—where Hailey’s Old West Rodeo was crowned “Rodeo of the Year” for an eighth straight year. Zoie has participated in the Miss Days of the Old West Junior Queen contest since she was nine. On horses since age three, Zoie has participated in horse shows, rodeos and queening. Her faithful companion through all these adventures has been her horse of 12 years, named Zoie’s Pep ‘N Trist, or Skoshie. Zoie and her little paint have won multiple buckles and awards together. · Kiffin Finn, 12, is a daughter of Jason and Tasha Finn of Rigby. She has competed in queen contests since she was seven. Kiffin is a horse lover who likes running barrels and poles, and breakaway roping. Last year in Hailey, she won Junior Queen horsemanship and tied for Photogenics in her class. · Brilee Hirschi, 9, of St. Anthony in eastern Idaho is a daughter of Taelon and Melissa Hirschi. Their home is just outside the small city, with the sandhills and junipers right out their back porch. Brilee is entering the fourth grade at Parker-Egin Elementary School. Last year she made quite an impression in Hailey, sweeping all the special categories in the PeeWee Queen category. Brilee carried her Hailey title to the IMPRA Finals and was crowned PeeWee Queen. She enjoys riding her horses, fishing with her family, playing the piano and moving cows out on the desert. One of her future goals is becoming a veterinarian. · Brandi Huizar, 18, is a daughter of Nico and Christina Huizar. She graduated this year from Hansen High School and plans to attend the College of Southern Idaho to study Dental Hygiene. She is a former 6th District High School rodeo queen. Brandi’s events in high school rodeo were barrel racing and goat tying. She enjoys doing volunteer work at the Rising Stars Therapeutic Center, and to show her dedication, she plans on obtaining a certificate to teach Hippotherapy, which is equine-assisted therapy for disabled people. · Kelli Lyn Ball, 16, is a daughter of Layne and Tamie Ball of Rexburg. She will be a junior at Sugar-Salem High School where she is active in Future Farmers of America, Business Professionals of America, Technology Student Association, Academic Decathlon and the National Honor Society. 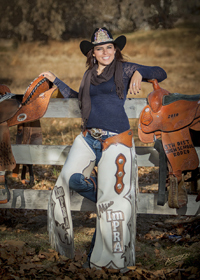 Among her goals is competing at the National High School Rodeo Finals and running for Miss Rodeo Idaho. Kelli enjoys an active lifestyle that includes snowboarding, high school softball and the rodeo team—in team roping, barrel racing, pole bending, goat tying and the queen contest. She plans on getting her nuclear engineering degree from Massachusetts Institute of Technology and eventually getting married and starting her family in the Western way of life that she loves so much. · Kloie Pierce, 15, is a daughter of Jim and Karen Pierce of Jerome. Two years ago in Hailey, she won the Horsemanship contest saddle blanket in the Junior Queen class. Kloie enjoys playing club volleyball, participating in 4-H and, most of all, competing in rodeos and queening. She rides her faithful horse of 12 years, Oshie. The big paint has packed her through many trails, won her many awards and has become her best friend and companion. · Cara Malone, 16, is a daughter of Ron and Kay Malone. She will be a junior at Jerome High School, where she is president of the rodeo team. Cara is a member of the FFA agricultural education chapter along with being secretary of her 4-H Club and 4-H District 3 Horse Council. Since a young age, Cara has been involved in hunting and fishing. She has been an Idaho State Bowhunting champion since 2008. · Emma Elaine Flolo, 13, is a daughter of Jack and Julie Flolo of Hailey. An honor roll student this past year at Wood River Middle School in Hailey, she will enter ninth grade at Wood River High. This is the fifth year Emma has participated in the Miss Days of the Old West queen event. Her favorite part is making new friends. Last summer, she participated in the Lincoln County Fair & Rodeo and was proud to be named 2014 Lincoln Country Junior Queen. It qualified Emma for the IMPRA queen contest last September where she was named 2014 IMPRA Junior Queen. Emma is a sixth-year member of the Hailey Wild Riders 4-H Club. She also competes in horse events at the Blaine County Fair in Carey. This is her third year of raising and showing pigs at the fair. Emma likes being part of her school choir and running cross country. She also enjoys playing Wood River and Storm basketball. · Bailey Cole, 11, is a Hailey resident who will be entering sixth grade at Wood River Middle School. She is the daughter of Erin Cutler of Hailey and Robert Cole of Boise. This is Bailey’s fourth time in the Miss Days of the Old West contest. She was the 2010 and 2012 PeeWee Queen. Two years ago, she won Poise and Personality, and Speech awards in her class at Hailey. Besides riding her horse named Fox and going camping with her family, she enjoys 4-H with the Wild Riders group in Bellevue, softball, mountain biking and skiing. · Kacie Anne Flolo, 9, is a daughter of Jack and Julie Flolo of Hailey. The fourth grader at Hailey Elementary School is participating in the Miss Days of the Old West contest for the second time. Kacie is a second-year member of the Hailey Wild Riders 4-H Club. She loves learning to ride and showing pigs at the Blaine County Fair. Kacie loves drama camp, running track and playing basketball. · Kailyn Bobbitt, 10, is a daughter of Devin and Sandra Bobbitt of Caldwell. She has graduated from fifth grade and will attend Vallivue Middle School. Kailyn enjoys playing with her three-year-old sister Rylee and teasing her 18-year-old brother Brandon, who just graduated from Vallivue High School and will enter Marine Reserves this summer. Kailyn likes to play soccer and basketball, but feels horses are her true sport. This will be her first queen contest. She has been riding since a young age and horse showing since she was four. She shows her 22-year-old Appaloosa mare named ZeeZee at the Idaho State Horse Show Association events and at Appaloosa breed shows in Idaho and Utah. River Sage Stables, Sun Valley Auto Club, Smoky Mountain Pizzeria Grill, Branching Out, Sun Valley Window Cleaning, Taft Design, 5B Roofing, Blue Heron Workshop, Professional Roofing and Finn Painting Inc.